"NEW YORK TIMES "BESTSELLER From #1 "New York Times" bestselling author Timothy Zahn comes an exciting "Star Wars" adventure, set in the time between "A New Hope "and" The Empire Strikes Back"--featuring Luke Skywalker, Han Solo, and Princess Leia Organa, as well as the deadly Mara Jade. Eight months after the Battle of Yavin, the Rebellion is in desperate need of a new base. So when Governor Ferrouz of Candoras Sector proposes an alliance, offering sanctuary for the Rebels in exchange for protection against a warlord intent on invasion, Luke, Leia, Han, and Chewbacca are sent to evaluate the deal. 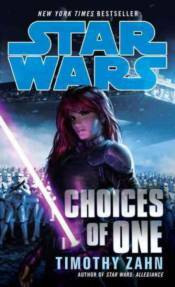 But Mara Jade, the Emperor's Hand, is also heading for Candoras, along with five renegade stormtroopers known as the Hand of Judgment. Their mission: to punish Ferrouz's treason and smash the Rebels. In this treacherous game of betrayals within betrayals, a wild card is waiting to be played.